I’ve been out of town for a week and I’ll let you in on where I was. I often hear, “I haven’t seen you all year” well even if I’m not at Deer Valley, I’m always skiing! 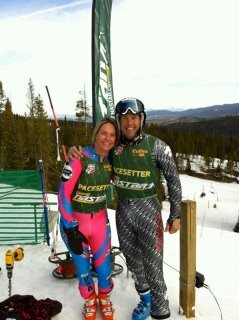 I have had the fortune of partaking in the NASTAR finals in Winter Park, CO for the last four years. No, I didn’t qualify, I’m invited to be one of seven pace setters. 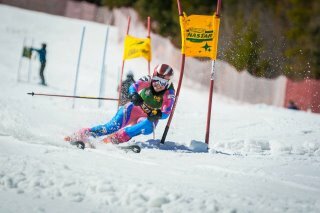 This entails trying to set the pace against, AJ Kitt, Jake Fiala, Doug Lewis, Ted Ligety, Picabo Street and Steve Nyman. The adventures begin Friday where we are paired up. I was with Doug (Mr. Universal Sports) and he had me laughing the entire time (not hard to do). We start by setting our new handicap with two runs then we go to our designated race arena. Somehow Doug and I had the most courses. Friday & Saturday we took 14 runs. 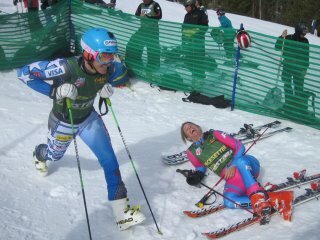 These aren’t free skiing, easy runs these are behind the wand race runs. Remember we are trying to beat each other, I must be getting old. We also have receptions, sponsor dinners and awards ceremonies that take hours. I’m not complaining just trying to shed some light on our busy days. Although the days are full it’s a blast to be around all these successful skiers. Some of the highlights of the weekend were seeing so many Park City families participating. Thankfully I see them at home because there is no time to catch up at the finals. I have seen one mother since being back and her comment was, “all of you are in your element, so fun to watch”. Another was my little buddy Colby Starr placing second in his age group. He was nervous on race day and I got to inspect the race course with him. I think it might have calmed his nerves. And the Sheppard family came through with bells and whistles to place two kids in their age group and top ten in the family events! Being paired up with Doug kept me laughing and on our final run after we crossed the finish with both laid down. People asked if we were tired? No we answered” were icing our backs”! The first day the courses were soooo tight. I blew my line all weekend trying to keep up. One time was I was going so slow Doug caught up to me and asked in mid-racing “how’s that turn working for ya?” I love going to the event (as we all do) because it lets us see over 1,200 people who love the sport. We try our best to say hi to all of you. It also allows us to catch up with our fellow teammates and be silly again. As I approach this next week at Deer Valley it will be the last of my season. For Spring Break were going to enjpy some sun and fun in Disneyworld! Should be interesting. I haven’t been there since I was the same age as my oldest son. I’ll understand what my mom went through. However, I will be home in time for closing weekend and closing day. I have a feeling the last day will be a snow storm. Should we make a bet? Maybe one of the best powder days will be April 15th. I look forward to a break in Florida but excited to always close the ski season at Deer Valley. Heidi, thanks for all you and the other pacesetters do at the Nationals each year. Seeing you and the others rip up the courses inspires us wannabes to try to do better. Hope to see you at many future Nationals! Oh, boy. Heidi nailed the prediction for an epic snowfall for closing weekend.